HIBS’ Moroccan stars lit up Leith with their flair as the Easter Road side secured their first win of the season. Abdessalam Benjelloun and Merouane Zemmama added enough spice to Hibs’ performance to ensure they got their first three points. Benjelloun scored the opening goal with a dash of panache, while Zemmama’s outrageous backheel flick up in the air sent Scott Brown through on goal for the second strike. Over-appreciating foreign talent can be a fault of Scottish football and it should be noted that a homegrown product, Brown, once again showed why he was one of the brightest prospects in the SPL. His perfect pass through to Benjelloun and the style, skill and aplomb with which he took the second goal set Hibs up for victory. His slip-up in the 90th minute which let Scott McDonald in for a consolation goal was surely excused by any Hibs supporter. Rob Jones got Hibs’ third, suggesting that the aerial presence the towering centre-back had brought to Easter Road would pay dividends. As in their previous home game against Aberdeen this season, Hibs immediately seized the initiative, piling forward with precision passing and soon they were creating chances. The first fell to Jones whose 6ft 7in frame was always likely to unsettle defences. His foray forward saw Motherwell fail to clear his aerial challenge and the loose ball fell sweetly for him to lash out, only for Paul Quinn to block the goalbound shot. Hibs began the season with a new strike partnership, Scotland under-19 cap Steven Fletcher alongside Benjelloun, replacing the prolific Garry O’Connor-Derek Riordan goal machine. In the tenth minute, they linked up well, Fletcher’s neat one-two with Benjelloun finding him bearing down on goal but, instead of shooting, he tried to slip in Zemmama on his right. Hibs should have gone ahead in the 31st minute when Zemmama exploded into action, switching to the left wing where he streaked past Steven Craigan and cut back to Fletcher. Again the young striker dallied, taking a touch instead of a crisp, first-time strike. The fractional delay allowed Motherwell to close him down. But Hibs had only a minute to wait before they finally cracked Motherwell’s defence. Brown picked the ball up on the left and cut inside. He raised his head to set Benjelloun on his run and rolled in the perfect pass at exactly the right pace so the Moroccan did not have to break his stride. Benjelloun skipped round goalkeeper Graeme Smith with one touch and gently placed it in the net with another. It now seemed only a matter of time before Hibs would add to their tally and a mixture of bad luck and poor finishing prevented Benjelloun from getting a second. 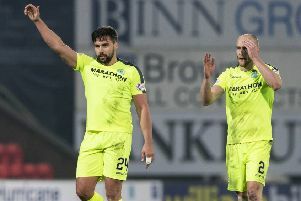 Hibs had a wake-up call when Steve McGarry hit the post against the run of play in the 54th but ten minutes later the second goal arrived. Zemmama’s vision put Brown through but he still had a lot to do, heading the ball down, dribbling it up to Smith and coolly slipping it under the goalkeeper. Benjelloun and substitute Ivan Sproule, on for Fletcher at half-time, could have made it three before Jones’ header from Kevin Thomson’s corner knocked the stuffing out of Motherwell in the 81st minute. When Motherwell did pick up their consolation goal with seconds to go, McDonald did not even bother to celebrate. Hibs: Malkowski, Whittaker. Murphy, Martis, Jones, Thomson, Stewart, Zemmama, Brown, Benjelloun, Fletcher.